“In Plain Site Los Angeles” will embrace the unusual performance spaces in Los Angeles museums to create a dialogue between the space and the audience. From Tuesday, March 7 to Sunday, March 12, the acclaimed New York dance company will perform selections from Brown’s rich archive in multiple venues including the Broad Museum, the Getty Center, the Los Angeles County Museum of Art, and Hauser Wirth and Schimmel. Performances are free and open to the public, unless otherwise noted. The project is led by Brown’s longtime dancers and hand-chosen associate artistic directors Carolyn Lucas and Diane Madden. At each site, the company will mine and then recombine seminal choreographies from Brown’s groundbreaking repertoire dating from 1963 to 2011. “Together with the Trisha Brown Dance Company we have created a mechanism that liberates Trisha Brown’s choreographies out of proscenium hall stages where most dance works are carried,” said Kristy Edmunds, CAP UCLA executive and artistic director. In Brown’s spirit of embracing unusual performance spaces and her background as a visual artist, the company will select a piece of chorography based on what suits its particular location. With “In Plain Site Los Angeles,” CAP UCLA showcases the subtle arc of Brown’s aesthetic, Edmunds noted. First in relation to the sweeping architecture of the Broad and Getty museums, then in response to several specific sculptural works at LACMA, and finally in open-air spaces surrounding the commercial warehouse gallery setting of Hauser Wirth and Schimmel, which is in keeping with the New York spaces where Brown’s earliest inspiration flourished. “This is very epic and it is reframing dialogue around Trisha’s exploration of sculpture, architecture and spatial design within L.A.’s local visual art and museum culture,” Edmunds said. “In Plain Site Los Angeles” will engage audiences in a dramatically different way, purposely shortening the distance between the performers and audience. Performances will be livestreamed and also videotaped to create an archival footprint. This documentation will become part of TBDC’s vast media archive, which is designed to engage users in creative dialogue with the works in yet another non-theatrical space as the documentation becomes part of ongoing collections at the museums and UCLA. Recognized as one of the greatest dancers and choreographers of her time, Brown’s role as the curator of her own work remains one of her most significant contributions to dance and art history. The project kicks off with a conversation by architect Liz Diller, art historian Susan Rosenberg and Edmunds at the Broad on March 6. The first public performances will be held at the Broad on March 7, available to viewers with a museum ticket throughout the day. 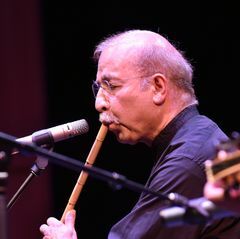 Two special 60-minute ticketed performances will be held at 6 and 9 p.m.
CAP UCLA and the J. Paul Getty Museum are partnering to present Brown’s work at the Getty Center March 10. This follows a 2013 collaboration which included the first-ever mounting of Brown’s iconic site work “Roof Piece” outside of New York City. The week of performances draws to a close on March 12 at Hauser Wirth and Schimmel with an examination of Brown’s artistic beginnings. Some of Brown’s first performances were in small commercial art spaces, held in neighborhoods that functioned as artist communities. Located in the heart of the burgeoning Downtown Arts District, Hauser Wirth and Schimmel showcases artists who have worked with her in the past. Brown, 80, ceased choreographing new work in 2013 and remains with her world-renowned company as founding artistic director and choreographer. In a career that spanned five decades, Brown received multiple accolades for her choreography including the National Medal of Arts, the Dorothy and Lillian Gish Prize, and the title of Commandeur dans L’Ordre des Arts et Lettres by the French government. She was also the first woman to receive the MacArthur Foundation Fellowship in choreography. Founded in 1970 when Brown branched out from the experimental Judson Dance Theater to work with her own group of dancers, Trisha Brown Dance Company offered its first performances at alternative sites, including gallery spaces in Manhattan’s SoHo. Her repertoire grew from solos and small group pieces to include major evening-length works for opera houses and theaters. Her body of work includes collaborations between Brown and renowned visual artists and musicians like Robert Rauschenberg and John Cage. “In Plain Site Los Angeles” is supported in part by The Andrew W. Mellon Foundation multi-year grant for Collaborative Intersections in the Visual and Performing Arts. Additional support is provided by Diane Levine, and the New England Foundation for the Arts through the National Dance Project. Performances are free, except as noted, and open to the public during venue operating hours. Conversation with architect Liz Diller, art historian Susan Rosenberg and CAP UCLA Artistic and Executive Director Kristy Edmunds exploring Brown’s influence on architecture. For tickets visit thebroad.org. Public performances throughout the day with museum ticket. There will also be ticketed performances at 6 p.m. and 9 p.m. Tickets for evening performances may be purchased at thebroad.org. For information and tickets to the CAP UCLA benefit please contact devinfo@cap.ucla.edu or 310.206.6431. Trisha Brown Dance Company peformance in a museum. 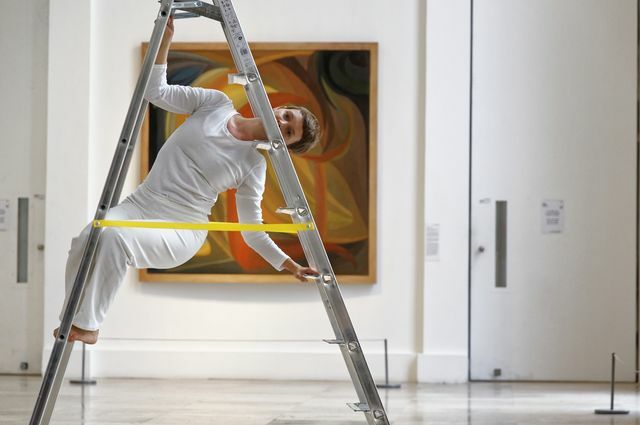 Dancer in the Trisha Brown Dance Company performing on a ladder in a museum. 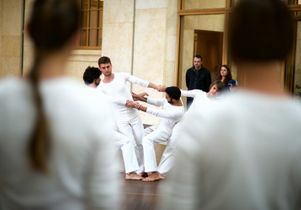 Dancers in the Trisha Brown Dance Company performing in a museum.